Microsoft's demo session of SmartGlass in action revealed new details and showed off some of its potential, both for media and gaming. demonstrated in more detail in a breakout session this evening, showing off video, gaming, and remote control possibilities as well as running through future concepts. I got as close as I could and took a few photos. First off, a few things you should know: Xbox SmartGlass isn't definitely intended for Xbox Live Gold members, but the apps and services it works with suggest it will be. Also, on-hand reps said that DVD second-screen functions haven't yet been in the cards: video content will need to be either downloaded or app-streamed by apps that support SmartGlass. Windows 8 tablets will work with SmartGlass, but there currently aren't any plans to make the service work with older Windows 7 tablets. 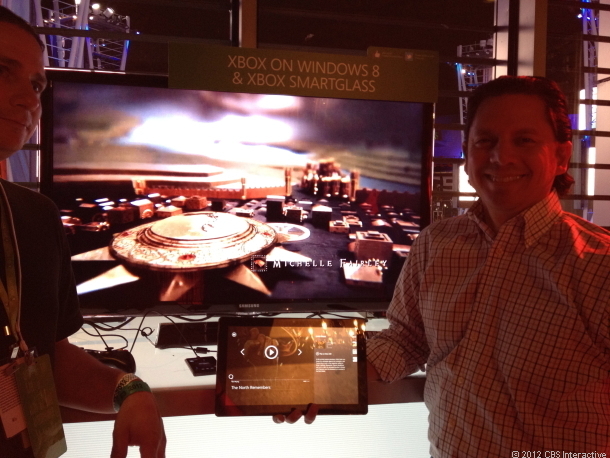 To work with a video, the content or app will have to be designed to interface with Xbox SmartGlass. Xbox Live has gained access to Paramount's library of movies, and Paramount films could be among the first to work. The movie School of Rock was shown working with SmartGlass, skipping scenes and calling up biographical information and related videos. 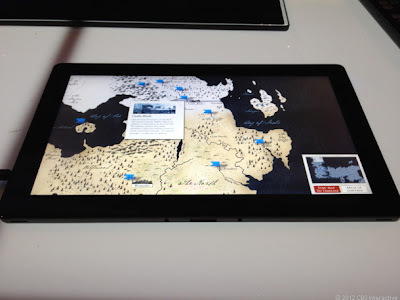 Game of Thrones worked like the E3 keynote demo, pulling up family trees and animated scrolling maps to augment the show itself. The speed of reaction, in the demo, between touching the second screen and triggering playback on the TV was fast, seamless. 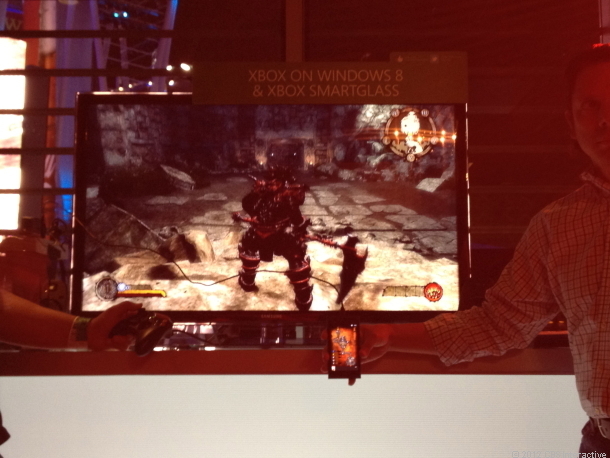 SmartGlass was also shown working with the upcoming game Ascend: New Gods, acting as a tiny map with animated features and icons. A future baseball game called Home Run Stars was discussed as well, where one player would call up plays on a tablet while another would pitch in the air and swing a bat via Kinect. SmartGlass will work with up to four connected devices at once, according to the reps, which suggests multi-player games with dedicated screens or controls. The presentation was clear to explain that apps would be created on a case-by-case basis. The enthusiasm of developers for creating ways to work with SmartGlass will be the challenge, and to have this type of technology be simple and easy enough for the average user. The app will be free, and while it sounds like an app that could have difficulty getting approved by Apple for iOS, the reps on-hand sounded extremely confident that wouldn't be the case, citing the existing Xbox Live app and their relationship with Apple. Why not use an iPad and search the web yourself for information on an actor, or use regular controllers instead of SmartGlass controls? To some extent, it's hard to judge right now in such an early stage. Also, the app will be free, and will work with many devices most people already own. Even if SmartGlass were just a clever couple-of-trick pony, it would be a free pony for anyone who already owned an Xbox 360. The SmartGlass app would have a small file size, since it's a streaming technology. What's shown on the tablet or phone screen could be swapped with what's on the large-screen TV, too.